I’m getting an early start this year and starting to organize my home. One area in particular that has been needing a makeover is my coat closet. It’s the only closet we have downstairs and it functions as a multi purpose closet including: office supplies, toys & games, cleaning supplies, & sometimes a coat’s. My husband has recently started working from home so he needs this to be organized so we can free up some space in our office. But of course I also love a good makeover! Our closet is pretty small, but it’s amazing how much stuff can be thrown into it. My before picture is pretty embarrassing, so hold your laughs! As you can see we have several vacuums, a broom, a steamer mop, a bookcase somewhere under there, toys, and office supplies everywhere. It was in desperate need of organizing. 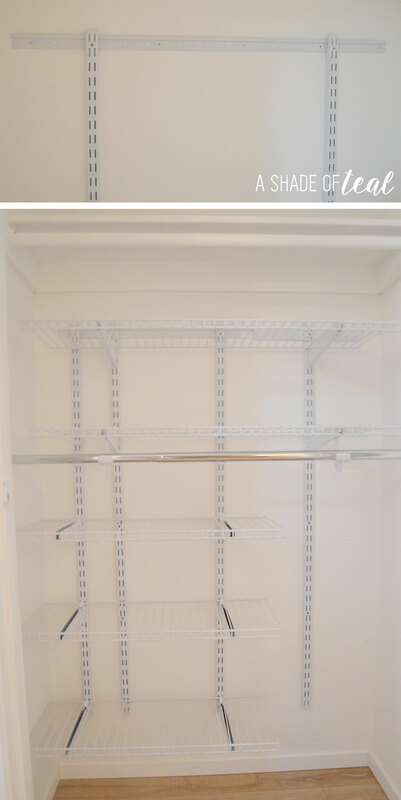 I started by removing everything except the built in closet pole and shelf. After that I measured the space and started planning how I wanted to organize it. I used the Rubbermaid® Storage Planner to plan everything out. It’s a really easy to use website that lets you customize a space how you want it then gives you a supply list to take to the store for all the pieces you need. 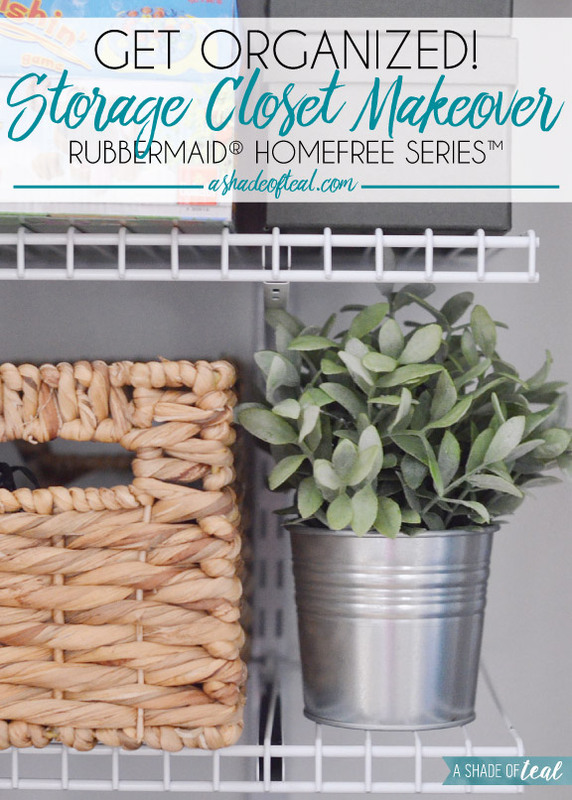 For my particular closet I was torn on using the Rubbermaid® HomeFree Series™ Closet Kits (typically used for bedrooms) vs. the Rubbermaid® FastTrack system (typically used for the pantry, laundry room, mud room, or linen closet). Since my closet is being used as a multi purpose closet I initially was going to use the FastTrack system; but it technically is a coat closet and I eventually want to go back to using it as a coat closet so I ended up using the HomeFree Series™. The best part is that either series is custom to suit your needs and can be reworked whenever you need it to be. 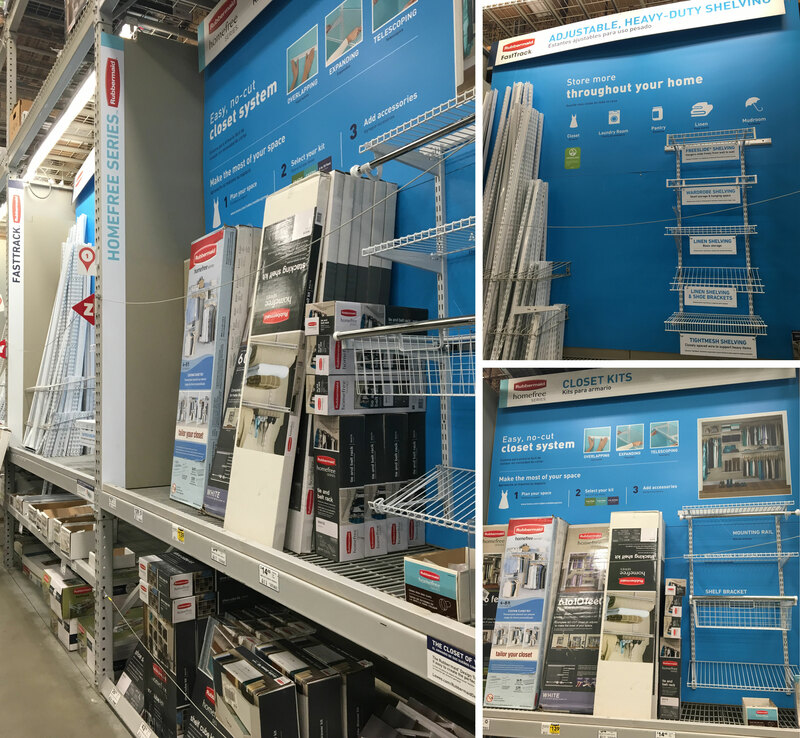 After customizing the closet on the website I took my list to Lowe’s to get my supplies. You can find the Rubbermaid® HomeFree Series™ and the Rubbermaid® FastTrack® at Lowe’s in their closet and organization aisle’s. 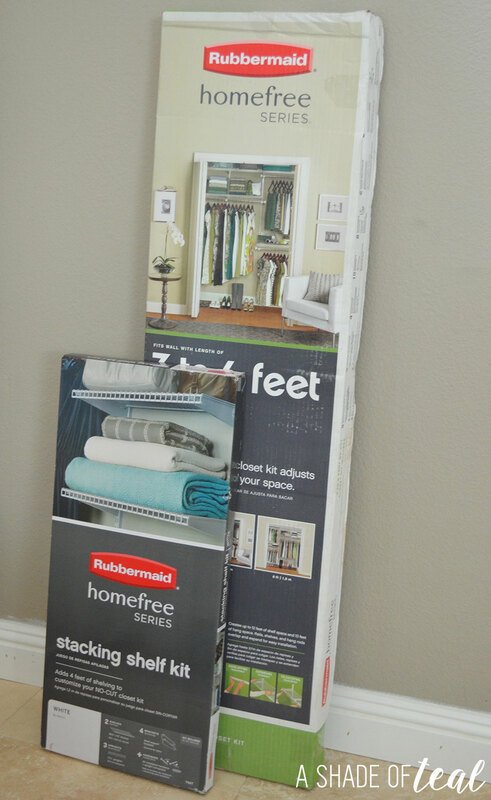 I ended up purchasing the Rubbermaid® HomeFree Series™ 3-ft to 6-ft White Adjustable Mount Wire Shelving Kit and the Rubbermaid® HomeFree Series™ Stacking Shelf Kit. The instructions are straight forward and easy to follow. Plus, all mounting hardware is included for easy installation. Once you install the hang rail to your studs, you just add the uprights then the rest is super easy. The best part, no cutting is necessary! This makes installation a breeze. I tried to keep as close to my original plan as possible, by leaving a tall open space for my cleaning supplies and gift wrap on the right, and plenty of shelving on the left. I ended up adding a extra closet rod in case I need to ever hang clothes. 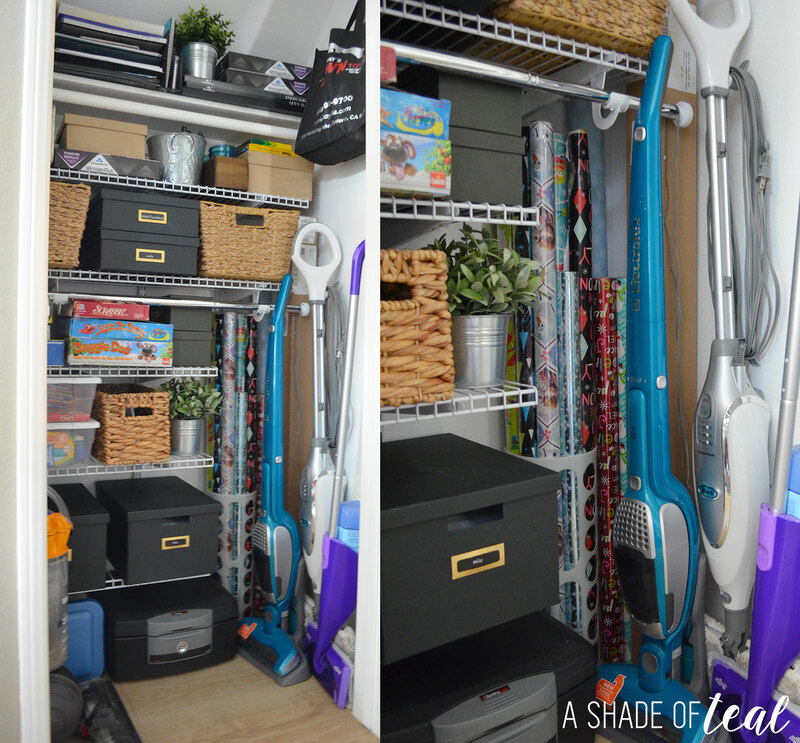 Once the Rubbermaid® HomeFree Series™ was set to the configuration I wanted, I started organizing the closet. I used several baskets and bins to keep the clutter out of sight. This closet is extremely functional now, so much I even have extra space to add some faux plants! If your thinking about Winterizing your closets here are some quick tips to help get you started. Step 1: Get a Fresh Start! If possible, clean everything out and set aside. Try not to go through the items yet as this project will turn from 15 minutes to 2 hours real quick! Step 2: Measure & Plan. Make a plan on how you want the closet to function. 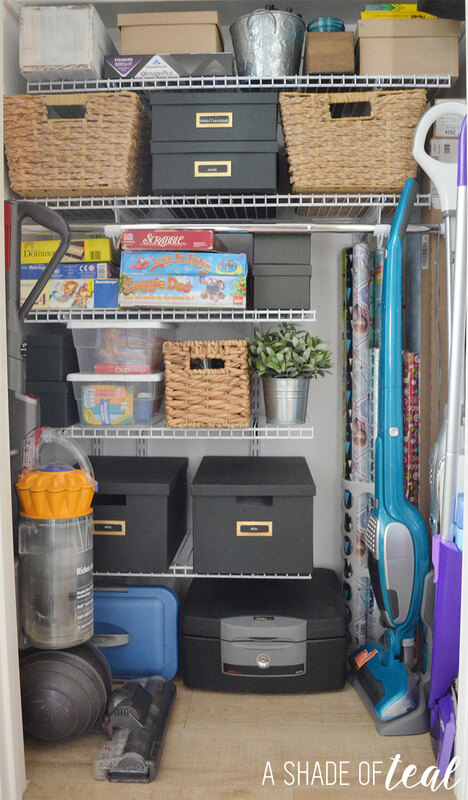 Using the Rubbermaid® Storage Planner makes this process fun and easy. You can use the website to work and re-work your closet till it’s just right. Then print the list and off to the store you go, super easy! Step 3: Install. Completely install the storage system. Step 4: Make it Pretty. I always find getting organized is much easier when you have matching bins, baskets, and boxes. Using labels also helps with keeping like items together. Step 5: Organize & De-clutter. The final step will take the longest, but if you have everything else ready to go it’s not that bad. I’ll lay out all my baskets & bins then sort through all the “stuff” that came out. This is the time to toss out what you don’t need or want anymore. 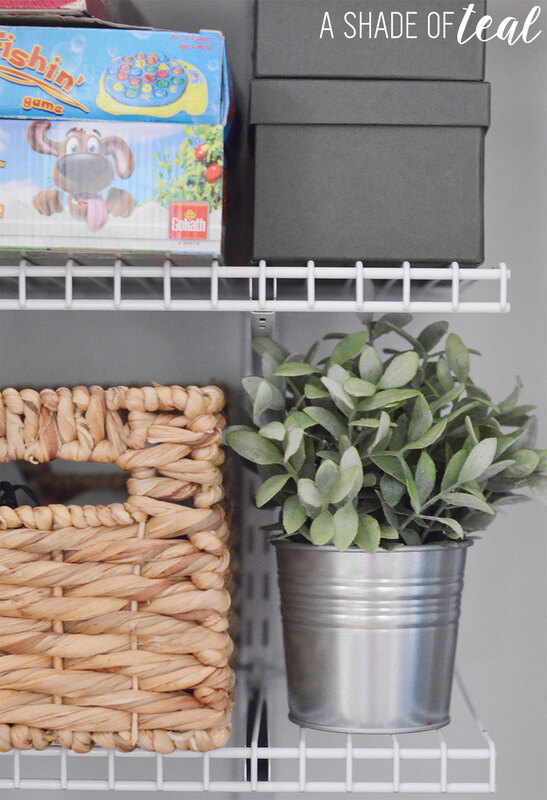 Having a place for everything definitely helps when trying to stay organized, but you can’t do that unless your closet has the proper storage. Are you getting ready to winterize your closets? Make sure you check out the Rubbermaid® HomeFree Series™ Closet Kits and the Rubbermaid® FastTrack system for your next closet makeover. 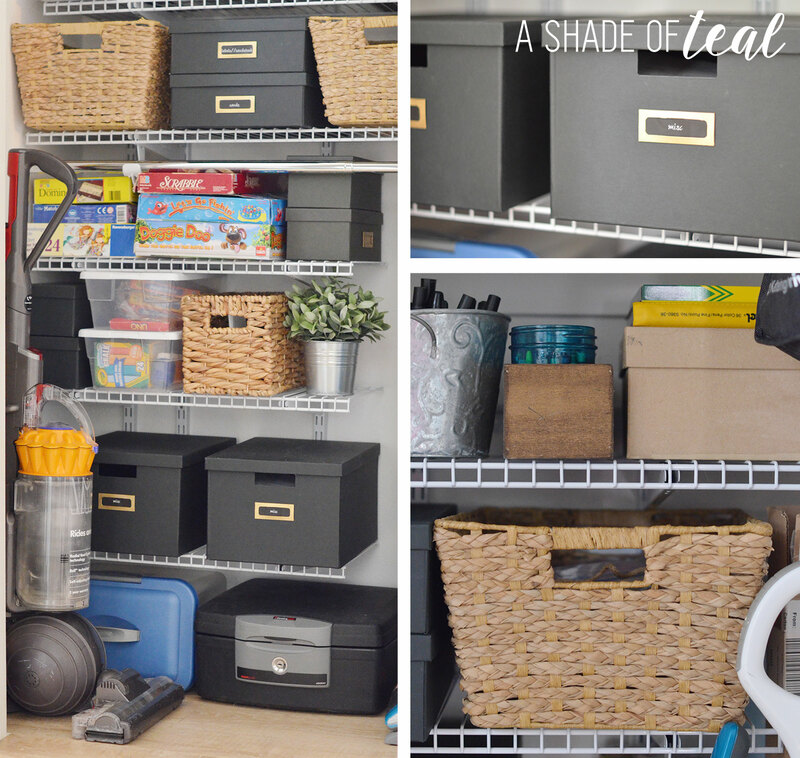 You can also follow Rubbermaid on Pinterest for tons of storage and organizing ideas. Hello! I'm a wife, mother to 3 little ones, D.I.Y. enthusiast, and lover of all things creative! A Shade of Teal is my place to share my love of design, home renovation, family life, and of course Teal! Enjoy! Modern Rustic Kitchen Makeover // ORC Week-6: The Reveal! Shopping for a New Front Door with Therma-Tru Benchmark! I need some of those for my closet, it is a mess right now. Thank you for sharing this! 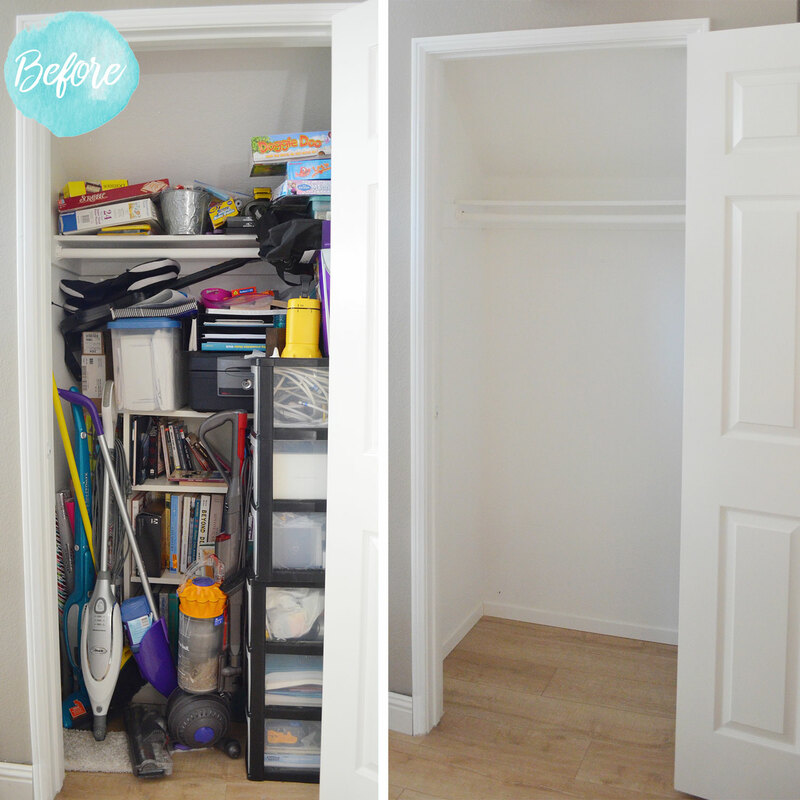 I love how your closet makeover turned out. I did a similar one to the closet in my bedroom and I love it. I’ve been thinking about doing this for the longest time! It’s about time I went to the store and bought some shelves for the house. These are awesome ideas! These are interesting and amazing ideas. Thank you for sharing this! I will keep in mind while organizing the storage closet. Can you come do my closet?? This turned out amazing and looks fairly easy to do! WOW! I totally need to do this. We have 3 closets that are struggling, lol. What a good makeover, Our house need an makeover too it looks like a warehouse lol. I love this! My closet needs help. Wow! You did a great job. My closet is a mess! I need to check these out. I am so overdue in organizing stuff at home, since we moved to a new house six months ago I still have boxes of things still packed. Specially clothes and books. I like the way it looks in the after. Organization makes me happy. It just FEELS better. YES! We just got our first home and I seriously need to do this! I have at least 3 closets that need to be reorganized and we just moved in 2 months ago. HAHAHA! Haha, 2 months is nothing. Were at 3 years and just now getting around to things! I love it! it looks so neat and organized and there is a space for everything. I need to take some time to do this. This is a great article. It answered my question about the difference between the HomeFree and FastTrack Rubbermaid systems. Thanks. And I liked the details about how to use the Rubbermaid Storage Planner website. Stay Updated! Get all the latest straight to your inbox! This blog, including all text, images, and other content, is the property of A Shade of Teal (unless otherwise noted). Use of entire posts; whether verbatim or paraphrased, is not acceptable. Photographs may not be altered or edited, including watermarks. Please contact for permission to use photos, including but not limited to images, text, or other content on this site. Tech Home Updates for Spring with Circle 2! Make Fetch Happen This Spring!